The National Highway Traffic Safety Administration has unveiled a first-of-its-kind prototype car with a new alcohol-detection system that is intended to stop a drunken driver from driving the car. For now, it's just a prototype. But it's a big step forward for a program the agency has been working on with automakers since 2008, one that could put an end to drunken driving for good. The car uses a technology called "Driver Alcohol Detection System for Safety." 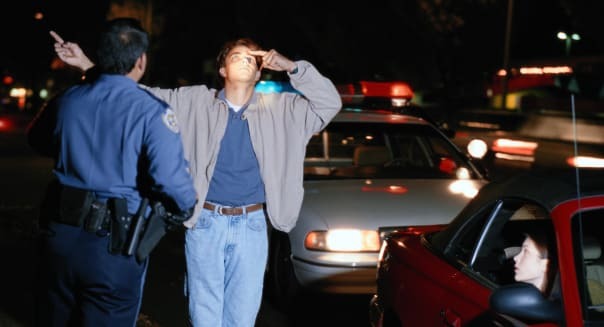 The DADSS system detects when a driver is intoxicated with a blood alcohol concentration at or above 0.08, which is the legal limit in all 50 states. If an intoxicated driver is detected, the car won't move. But how does it work? There are actually two different technologies being developed under the DADSS program. One is a system that quietly checks the amount of alcohol in a driver's breath as she breathes normally after sitting down in the car. The other is a touch-based system that measures blood alcohol levels under the surface of the skin on the driver's fingertip with a sensor that uses an infrared light. The idea is that the touch-based system could be mounted in the car's starter button, somewhere the driver will need to touch in order to get the car running. But either or both mechanisms could be included in the version of the DADSS system that comes to market in a few years. Current systems to prevent drunken driving are cumbersome. They require drivers to breathe into a sensor device before starting the car. That has greatly limited their use. What makes the DADSS system different is that it's passive -- it works without any action at all from the driver. Like an airbag, it works in the background, without any effort needed from the driver -- until it's needed. Then it steps in to prevent an intoxicated person from driving. NHTSA officials think the technology will be very popular. One audience that's expected to embrace it very quickly: parents of teen drivers. While the system will default to a blood alcohol limit of 0.08, in line with state drunken-driving laws, it can be set lower, all the way down to a "zero tolerance" mode. That mode would stop a driver with any detectable level of alcohol from driving. NHTSA thinks that will appeal to parents of drivers younger than 21 years old -- and it's probably right. But one could easily imagine other applications for a "zero tolerance" mode -- vehicles driven by on-duty public safety officials, for instance. The DADSS technology is still under development, but it's coming. Rosekind hopes to have the technology available for testing, probably by a government or commercial vehicle fleet, within a few years. Once it's proven, he hopes it will be offered as an option by automakers. He's convinced that demand will be strong as parents of teens, operators of commercial fleets, and others demand it on their new cars. It could be widespread within 10 or 15 years. And it's likely to be widely available as soon as it's perfected. Nearly all of the automakers that do business in the U.S. have signed on to the program. Jeff Boyer, General Motors' (GM) vice president of global safety, said that the technology "has the potential to prevent tens of thousands of needless deaths and injuries every year." Boyer emphasized the passive, unobtrusive nature of the technology, comparing it to air bags and electronic stability controls. That's a strong hint that GM will be in the forefront of adopting the new anti-drunk en-driving system. Given the widespread publicity around the dangers and costs of drunken driving -- and the likely demand from concerned parents of teen drivers -- its competitors are likely to follow suit quickly. Motley Fool contributorJohn Rosevear owns shares of General Motors. The Motley Fool recommends General Motors. Try any of our Foolish newsletter services free for 30 days. Check out our free report on one great stock to buy for 2015 and beyond.